The Floyd Butterfield project was in response to a $50,000 prize offered in 1980 by the Calif. Dept of Agriculture. The intention of the contest was to encourage farmers to make their own fuel. Mr. Butterfield won over many other farm stills built during this contest, because of its efficiency and overall integration of the entire process of using feedstocks and waste products on a family farm. Floyd Butterfield material is a true ethanol fuel pioneer, and he built and ran quite a decent traditional still with a lot of heat-recovery improvements. This report provides details concerning the design, construction, operation and performance of the FSB Energy Fuel Alcohol Plant. The report was compiled in response to the announcement by the California Department of Food and Agriculture and the State Solid Waste Management Board of their joint sponsorship of the Alcohol Fuel Plant Design Competition. The FSB Energy Fuel Alcohol Plant is located on a ranch approximately six miles north of Paso Robles, California. It presently is operated by one man on an approximately eight hour per day test basis. The plant-currently processes off-market barley and wheat. The processed grain co-product of the plant is being sold to local dairy operators as a high protein component in the milk cow ration. The ethanol product is being tested and evaluated as an alternate motor fuel by several local vehicle fleet operators. 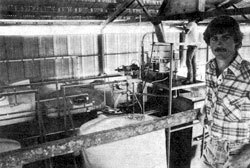 Production of 10 gallons per hour of 190 proof alcohol, on a regular 24 hour per day schedule is anticipated by July 1, 1981 or sooner. In May, 1980, Floyd Butterfield of Paso Robles, California and Stuart Gildred of Santa Ynez, California formed a partnership to construct a small and efficient fuel alcohol plant. The purposes of building the plant were to promote awareness of an alternate, renewable fuel, to manufacture and sell the fuel, and to gain the expertise needed to manufacture and sell low cost and efficient fuel alcohol plants in the future. Design of the existing plant began in March, 1980, and construction was initiated in June of that year. Almost all components of the plant were either built at the on-site shop or purchased as off-the-shelf items. The sieve plates e£ the distillation columns were custom-made to specifications by a local sheet-metal shop. The performance of the distillation columns and associated equipment was tested in October and November of 1980. Subsequent to this successful testing, further equipment was designed, and built or purchased, to allow semi-automatic continuous production at the plant. Operation resumed in April, 1981 with the plant most recently producing approximately 12 gallons per hour of 180 proof ethanol on an eight hour per day test basis. Front-end handling involves preparation of the feedstock for processing. This preparation consists of reducing the feedstock particle size to render it susceptible to enzyme breakdown and efficient mixing during cooking. In selecting a specific grinding technique one must also consider the end use of the cooked feedstock and the solid/liquid separating method used later in the process. For most grain feedstocks we prefer the use of a roller mill. A roller mill produces uniformly reduced grain with a low percentage of fines. Roller mills also use significantly less energy than most other types of grinders. A roller mill with a minimum capacity of 3000 to 6000 lbs. per hour should be employed. Much of the feedstocks are obtained already ground. If the feedstock contains larger foreign material (such as dirt clods and small rocks) then it cannot be processed by a roller mill without first being crudely sorted. This sorting can be accomplished by a "scalper". An alternative to a roller mill is a hammer mill. It can successfully grind a wide variety of feedstocks and can directly process feedstocks containing some foreign materials. Feedstocks should be ground by a hammer mill to pass a 1/8 to 3/l6 inch mesh screen. Following particle-size-reduction, the feedstock is augered into the feedstock storage tank shown on Plate 1. From there it is augered onto a scale, weighed and augered into the cook tank. The augers shown on Plate 1 are four inches in diameter and powered by 1 hp. electric motors. The scale is of the type used to weigh bagged almonds, walnuts, etc. and has a 1000 pound capacity. Any type of scale with a capacity of several hundred to several thousand pounds may be used. Handling of other than grain feedstocks requires the use of appropriate methods for particle-size reduction, transfer and weighing. The cooker is a 3000 gallon mild-steel tank typically used for underground fuel storage. It is positioned on two steel support pillars and tilted toward the outlet at an approximately 10° angle [Plate 1]. The tank is equipped internally with a 1-1/4 inch diameter perforated steam line for direct injection of steam and a paddle-type mixer. The mixer consists of four paddles mounted on a two-inch diameter shaft which passes longitudinally through the cooker. The mixer is powered by a l-1/2 hp. motor/gear reducer combination coupled by chain drive to the mixer shaft. The outlet from the cooker is via a two-inch valve and hose connection. The separator is used to separate the solids from the liquid portion of the mash prior to fermentation or distillation. It consists of a nine-inch diameter doubleflighted auger positioned horizontally within a 9-1/4 inch diameter perforated sheet-metal tube. The auger is mounted on a two-inch diameter steel shaft which is turned by a hp. electric motor/gear reducer combination. Whole mash is pumped into a hopper at one end of the auger tube. As the mash is augered along the tube, the liquids fall through the perforations, are collected in a basin, and directed to a two-inch hose outlet. The solids continue along the tube, are pressed in a short, augerless section at the end of the tube and then discharge and fall by gravity into a truck. The liquids discharge out of the separator and may be directed either to a tube-in-tube heat exchanger or directly to a tank via hose connections. Each fermenter consists of a 1300 gallon plastic tank, the type typically used for above-ground water storage. Each tank is positioned on a stand made of two-inch diameter steel pipe and tilted toward the outlet at an approximately 7° angle. Each fermenter is equipped with a thermometer. During distillation, fermented and filtered mash or "beer" is pumped continuously from the beer well by a 1/6 hp. centrifugal pump. Flow is regulated by a globe valve and monitored by a flow meter. The beer proceeds to the inlet of Heat Exchanger 2 as shown on Plate 2. This is a single-pass, tube-in-shell heat exchanger available as an off-the-shelf item from several manufacturers. From the outlet of Heat Exchanger 2, the beer proceeds to the inlet of Heat Exchanger 1. This is a two-pass tube-in-shell heat exchanger, also available from several manufacturers. From the outlet of Heat Exchanger 1, the beer is fed directly to the inlet of Column 1. Column 1 is illustrated on Plate 2. Its shell is an eight-inch diameter mild steel pipe and the internals are all mild steel. The beer feed is injected into the downcomer of the second highest plate in the column. The feed falls down the downcomer and impinges on a blank portion of the plate below (see illustration of sieve plates on Plate 2). It then travels across the perforated portion of that plate, over the outlet weir, and down the downcomer. After traveling down the entire length of the column and across each sieve plate the resulting "bottoms" product or "stillage" is pumped through Heat Exchanger 1 and to the stillage holding tank (Plate 1). The pump at the base of column 1 is a 1/6 hp. centrifugal type. The purpose of Column 1 is to "strip" all the alcohol out of the feed. Low pressure steam is injected into the base of the column and rises through the plate perforations. The steam carries with it the alcohol in the feed and some water. Alcohol vapor at approximately 100 proof leaves the top of Column 1. The alcohol vapors from the top of Column 1 proceed through the exhaust tubing shown on Plate 2 and enter the base of Column 2. These vapors rise through the perforations in the plates of Column 2 and exit at the top of the column. The vapors are then partially condensed by the beer feed passing through Heat Exchanger 2. Next, they pass through the air-cooled heat exchanger shown on Plate 2 (a truck radiator in this case) where they are completely condensed and sub-cooled. The sub-cooled product flows by gravity to the reflux drum where a portion of it is pumped back to the top of Column 2. The reflux pump is a centrifugal type, powered by a 1/3 hp, single phase, explosion-proof electric motor. The reflux flow rate is controlled by a temperature-regulated valve whose sensor is placed in the top of Column 2; the rate is monitored by a flowmeter. The portion of product that is not returned to Column 2 as reflux flows out the overflow of the reflux drum (Plate 2) and through Heat Exchanger 3, a single-pass tube-in-shell type (available off-the-shelf). Cool water flows through this heat exchanger at approximately 1 to 2 gallons per minute and comprises almost the entire process water consumption of the plant. It is directed from this exchanger to a holding tank for use in the cooker or to the steam boiler. Heat Exchanger 3 also serves as the vent passageway and thus cools any gases or vapors vented by the system. The final ethanol product flows by gravity to a 300 gallon plastic holding tank. Heat in the form of steam is supplied to the cooker and distillation section. A 10 hp. propane-fired steam boiler is presently being utilized. Any source which provides an equivalent quantity of heat at approximately 212°F or greater may be employed. When the heat is not in the form of steam, a heat exchanger at the base of Column 1 can be used and intank pipes or another method of providing heat to the cooker must be utilized. The ethanol production from each 24-hour period i5 accumulated in the 300 gallon plastic holding tank. It is then checked for proof, denatured and transferred by gravity to bulk storage, an underground steel fuel storage tank. The wet grain co-product discharged by the separator is accumulated in a truck and fed daily to dairy cattle. There is no co-product storage. A portion of the stillage from the bottom of Column 1 is the only waste product of the plant. The stillage consists of hot water containing dissolved and suspended solids not removed by the separator. At present, approximately 25 to 40% of the hot stillage is reused in the cooker. This accomplishes a substantial savings in process water consumption and in BTU's since each cook begins with preheated water. The portion of the stillage that is not recycled is directed to a holding tank (Plate 1) via another single-pass heat exchanger which preheats the boiler feedwater. Presently, this remaining stillage is periodically discharged to an outside holding pond where it is allowed to percolate and evaporate. The plant is designed to operate 24 hours per day at 10 gallons of 190 proof ethanol per hour. Based on operation six days per week, annual production would be 70,000 to 75,000 gallons. Design quality is 190 proof at 10 gallons per hour. Proof can be diminished somewhat by decreasing the amount of reflux, giving a corresponding increase in final product rate. There are two types of energy input to the production process, electricity and boiler fuel in the form of propane. The following two tables illustrate the use of these energy sources on a kilowatt hour per gallon (KWH/gal) and BTU per gallon (BTU/gal) basis. (3) lights, boiler controls, water softener, etc., estimated at 20% of plant total. The external energy requirements of the plant are presently being met by conventional energy sources. Electricity is supplied by the local utility and the boiler fuel being used is propane. Examination of Tables 1 and 2 and use of a conversion factor of 1 KWH = 3413 BTU reveals that approximately 10.5% of the plant's energy use is electrical and 89.5% is provided by the steam boiler. Any number of devices that provide the needed electrical and heat energy from-renewable sources may be utilized. The only requirements are that the electricity provided must be compatible with the needs of the electrical equipment used and the heat source must be capable of providing the required number of BTU's at approximately 212 deg F or greater. By carrying out the solid-liquid separation process before fermentation, the processing of all feedstocks is nearly identical from after separation through distillation. The front-end-handling, cooking, mixing and separating equipment of this plant have been designed and used for processing various grain feedstocks. The use of any non-grain sugar or starch feedstock would simply involve modification or replacement of some of this apparatus with appropriate equipment. The FSB Energy Fuel Alcohol Plant operates at a remarkably high energy efficiency and yields consistent, high quality products. Extensive use of heat recapture and efficient plant layout allow minimum consumption of external energy inputs. One man presently operates and maintains the plant and equipment. Several grain feedstocks have already been processed and the plant is adaptable to processing a wide variety of materials. Almost all major components were either built in the on-site shop (a typical farm-equipped shop) or purchased as off-the-shelf items. Materials of construction are primarily mild steel, but all fermenters and holding tanks are plastic. With the exception of the distillation column internals, projected equipment life is a minimum of ten years during which only routine maintenance will be required. The useful life of the column internals, constructed of mild steel, is presently unknown. These internals could be easily constructed of stainless steel should it be necessary. The total investment in the equipment at the plant is approximately $40,000. This figure is based on purchase of new, off-the-shelf items and could be reduced by employing used equipment where possible. In summary, we believe the FSB Energy Fuel Alcohol Plant is one of the most low-cost and energy efficient, continuous production fuel alcohol plants available. It can provide the owner/operator with a consistent product yield for direct use or sale. By processing off-market grains or waste products, the plant can show a substantial operating profit.